Our organic cotton newborn contours are made from three layers of soft organic fleece knit. The belly button cutout feature helps healing of the umbilical cord. These are perfect for those first few weeks! These organic contours fit beautifully into our fitted diapers for extra absorbency and are also great for use in pocket diapers. 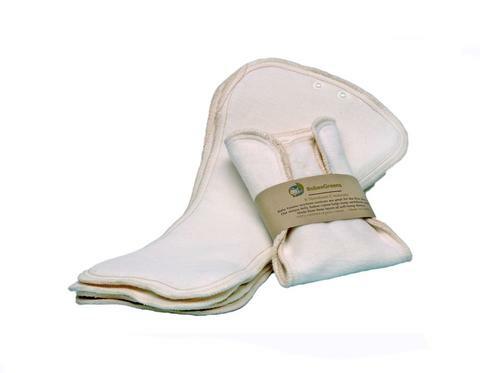 For heavy wetting, combine with our hourglass organic cotton doublers for additional absorbency. Available in 100% Certified Organic Cotton or 55% Hemp / 45% Organic Cotton Blend.